You’re our favorite candy! You’re a huge nerd! Now you can be both at the same time in our Willy Wonka Nerds Box Costume! Not one of the Wonka candies originating in Roahl Dahl’s book or the classic Gene Wilder movie, Nerds are instead a product of the same 80s craze for pure sugar that produced Pop Rocks and Candy Buttons. For we children of the 80s and 90s here at HalloweenCostumes.com, however, they’re a far more essential part of the candy landscape than Evelasting Gobstoppers or any other part of the Wonka lineup besides maybe Laffy Taffy. For the authentic sound effects of the recognizable Nerds box, strap maracas in your waistband to get that shaking sound. Don’t be surprised if you’re chased by the school-aged set eager to get their hands on what’s inside your box. Everyone loves Nerds! Okay, maybe not that annoying know-it-all who’s always pushing his glasses up and informing you actually they never say “Beam me up, Scotty,” in Star Trek, but the candy. Definitely the candy. It’ll be hard to keep the hands off of you in this Adult Nerds Box Costume. That’s why is for adults. Didn’t nobody say nerds don’t get freaky, son. Resist the temptation to eat the contents, because this Willy Wonka Nerds Box Costume is made out of 100 percent polyester –– no sugar, dextrose, malic acid or high-fructose corn syrup. It has holes for your head and arms, NOT for pouring Nerds out of. There’s a large opening at the bottom for your legs, so all the Nerds are spilled out. 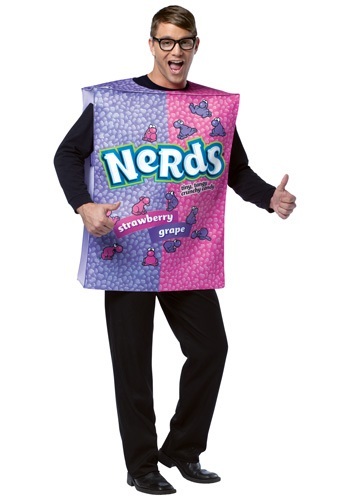 If they ask where the Nerds in your box went, just point to yourself, doy!